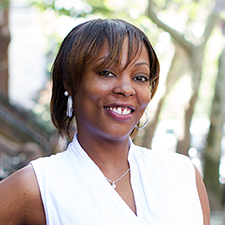 Deenie specializes in Brooklyn sales and rentals with an emphasis in Bedford Stuyvesant, Crown Heights and Lefferts Gardens. B.A. in English from Hunter College. Udeen, also known as “Deenie” resides in, and is a native of Bedford Stuyvesant, Brooklyn. In her youth, she was an avid competitive swimmer. She subsequently became a swimming instructor, swim team coach, and ultimately an Aquatic Director for the YMCA, while simultaneously pursuing her B.A. in English at Hunter College. Having satisfied her aquatic hunger, Deenie delved into the world of real estate as an administrative assistant. She quickly became enamored with the challenging and exciting world of real estate and knew that she was forever committed. Deenie’s professional experience and knowledge, combined with her welcoming demeanor, allows her the skill set and confidence needed to excel in any environment. She brings a unique array of attributes -youthfulness, maturity, energy, professionalism and trust - which gives her customers the confidence and reassurance needed throughout one of the most important financial decisions of their lives. She has been in the business over ten years and is committed to guiding her customers along the journey of finding their perfect home. She is an avid gardener, and supports her block in Brooklyn’s annual Greenest Block contest with her fabulous rose garden. With respect, humility and honesty, she is committed to guiding her customers along the journey of finding their perfect home. The Dean Estates proudly presents class meets luxury - a grand single-family townhouse with three-car garage in Rockland County. Tucked away in sweet serenity, this landscaped property is move-in ready and complete with all the conveniences and charm one could ask for. Sun-flooded and tastefully renovated, property features 4 large bedrooms, 3.5 baths; along with a sprawling living room, cozy dining room and private study. Large eat-in, windowed kitchen has been updated with granite countertops, white cabinetry and stainless steel appliances - leading to a large front porch to entertain guests for hours while overlooking amazing greenery and scenery. Climb spiral staircase to an extremely generous master-bedroom with large en-suite jacuzzi bath, sky-light, private balcony and large floor to ceiling windows offering amazing views. Property also features large bay windows surrounding entire property, extremely large finished basement, laundry room, hardwood flooring, ceramic tiling and ample closet space throughout. This gem is a must-see and surely won't last! Call for an appointment today!